I’ve met dozens of freelance travel writers in the past few years and have been surprised at how few have a professional website that touts their writing achievements. A well laid out website that shows indisputable evidence that you are well published is—in this day and age—an essential tool. Will a writers website garner you more assignments with magazine editors just by its mere presence? Probably not. But, a professionally designed writers website will very likely tip the scales in your favor when you’re querying an editor with a story idea. If the editor is undecided about hiring you because they don’t know you, a well-designed website will nudge them in the right direction. Today, there is little excuse not to have a website and most editors expect it. Your professional website is your writing portfolio and it can be much more. Building a website doesn't have to be expensive or difficult. And it's an important marketing tool for a freelance writer. Having a web presence enhances your credibility. It is effortless promotion that an editor can access 24/7. What are the most important parts of a writers website? 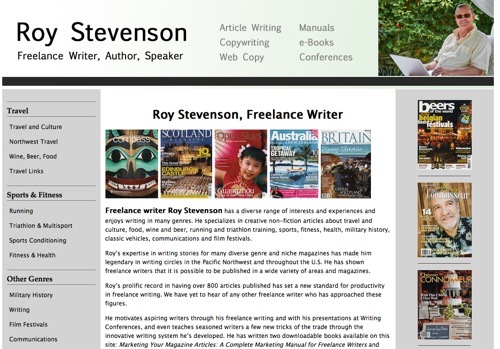 I'll use my own writer's website (www.roy-stevenson.com) as an example. Here’s a screenshot to show you what editors see when they follow the link to my site. One of the best ways to establish bona fides as a well-published travel writer to magazine editors and tourism agencies is through two very important sections on your writer’s website: one section describing each of your writing genres, and another section with testimonials from editors and tourist agencies. The sections are obvious necessities for all travel writers, yet I seldom see other travel writers using them. So it’s one important way you can differentiate yourself from other travel writers out there. I parlay my professional website to magazine editors and tourism agencies to get their attention for assignments and more travel than I can handle, and you can do this with your website, too. 2. tourism agency professionals who can provide you with travel story ideas and assistance with your travel arrangements. So, when I’m planning a trip and pitching stories, my objective is to convince editors that I’m a seasoned travel writer and that I’ve written for a large number of magazines. My query letters always refer editors to my professional website to see samples of my work. If they are considering one of my pitches, a glance at my writer’s website will most likely tip the scales in favor of assigning me the story. You want to design your website to assure travel editors that you are an active, professional travel writer. You also want to convince them that you are able to deliver your stories on time and that you do high quality work. Ideally, your professional website will contain several samples of your travel articles. You want to post enough articles to show that you’ve been published consistently over time. So, keep your website updated. Add new articles every month or two to show that you are still being published consistently. If you write in different genres, even within the “travel” category, I’d suggest that you have separate navigation links to each genre. For example, I have separate navigation for “Northwest Travel” which is one of my specialties, and separate navigation for “Wine, Beer, Food” – another specialty. My other travel articles published in print are in a separate category named “Travel and Culture” and my online articles are shown under “Travel Links”. You will divide your stories differently than I have, but the point is to segregate your articles in a way that makes sense. Each category needs to be specific enough that editors interested in a particular specialty area can easily find samples. This is important – editors are busy people and they won’t waste their time on a confusing or complex website. I know that lots of people are building professional websites with all sorts of bells and whistles these days and they look really trendy. But unless you’re selling web design expertise rather than your writing skills, I’d suggest that you focus on simplicity. Do everything in your power to keep your professional website simple and easy to navigate. Editors and travel agencies will love you for it. Showing samples within your different writing genres displays your portfolio for editors to scan. Your portfolio is especially important to editors not familiar with your work. But the ace-in-the-hole for marketing yourself is when you add testimonials. As you build up your writing portfolio you can be collecting feedback from editors about your work. Sometimes this feedback is given freely; other times you need to ask for it. In either case, always ask the editor’s permission before posting a testimonial on your website. The section titled “Editor’s Comments” on my website has over one dozen glowing reports from magazine editors about my work. These testimonials provide evidence of my ability to come up with good story ideas and meet deadlines. If you go to this section on my website, you’ll notice that the editor’s names and publications are listed with their comments. This way, other editors can contact them to verify the testimonials. Once I have lined up several travel assignments, it’s time to contact the tourism agencies at my destination to see how they can help with my travel arrangements. So the other major purpose of your professional website is to convince tourism agencies (in the U.S. we call them Convention and Visitor’s Bureaus, or CVB’s) that you are undeniably worth their effort and expense of covering your hotel, meals, and entry to tourist attractions in their city or region. When I contact the CVB’s, I’ll refer them to my travel website sections to convince them that I’m a well-published travel writer. They will be interested in both print and online publications so make sure you refer them to relevant links on your website. Providing a large number of writing samples shows the tourism agencies that you’re not a ‘pretender’ who is out to take advantage of their assistance. Unfortunately, some people call themselves “travel writers”, milk the tourist agency’s assistance and goodwill and then disappear off into the sunset, without ever delivering the promised travel story. As a result, many CVB’s are skeptical about a writers, so this is one more way your website can help you. You want to convince tourism agencies beyond any doubt that you have produced copious travel articles, and that you’re not one of those working the system. 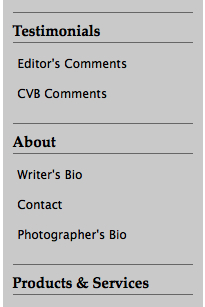 So, add a section to your professional website with comments from the CVB’s you’ve worked with in the past. After I’ve produced articles from a previous press trip, I contact the CVB and request a testimonial via email. If you’ve done a good job of writing one or more articles, they are typically happy to provide a paragraph or two describing what it was like to work with you. And, as with “Editor’s Comments” section, you will want to list the names of the tourism agency professionals who provided comments. The tourism industry, especially within a state or region, is small enough that they know each other – or at least feel comfortable contacting their colleagues to verify a writer’s abilities and productivity if they feel the need. The overall effect your writer’s website should be to show evidence of a good cross-section of your work, to prove your travel writing background and provide real-world credentials from the people who have worked with you – the editors and tourist agencies. Putting together a well designed, professional writers website website will enhance your marketing efforts and you’ll find it will save you time and give you credibility that simply doesn’t come across as well in a query letter. Your professional writer's website will give strong support to your query letter to an editor you don't know - let your website do this work for you.